Prof. Dr. Petra Steinorth has been holding the chair in Risk Management and Insurance at the Hamburg Business School since February 2018. Before joining the University of Hamburg, she had been Assistant Professor (09/2011-08/2016) and then Associate Professor (09/2016-01/2018) at the School of Risk Management (St. John’s University, New York). Her research in the field of risk management and insurance, risk preferences, employee benefits and health insurance is published in top tier journals in risk and insurance (Journal of Risk and Insurance), actuarial sciences (Insurance: Mathematics and Economics), health economics (Journal of Health Economics and Health Economics), and public economics (Journal of Public Economics). Petra Steinorth serves as an associate editor for the Risk Management and Insurance Review and the Journal of Insurance Issues. She is a regular reviewer for various journals including the Journal of Risk and Insurance, the Journal of Health Economics, and Insurance: Mathematics and Economics and a longstanding member of the American Risk and Insurance Association as well as the Risk Theory Society. 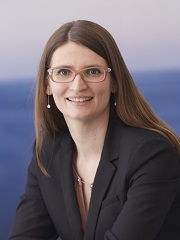 Petra Steinorth is a core member of the Hamburg Center for Health Economics (HCHE) and an associated member of the Munich Risk and Insurance Center (MRIC). Petra Steinorth holds a combined Bachelor's/Master’s degree in Mathematics and Economics from the University of Hamburg, a Master of Business Research and a PhD in public economics from Ludwig-Maximilians-Universität München. Among other prices, her PhD thesis was awarded the prestigious Ernst-Meyer-Price of the Geneva Association for significant and original contribution to the study of risk and insurance economics. The Demand for Enhanced Annuities. Using Experiences from the U.S. to implement HSA to German Statutory Health Insurance. Value from hedging risk with reinsurance. Impact of health savings accounts on precautionary savings, demand for health insurance and prevention effort. Incentives and Compensation in Medical Networks with Capitated Gatekeepers and Case Managers. Enhanced Annuities Produktinnovation als Lösungsstrategie für das Annuity Puzzle? Zeitschrift fuer die gesamte Versicherungswissenschaft, 97 (S1), 71-89.